I have been asked by a self-taught value investor Rishi Sondhi to give a short presentation/talk on investing. I've never been to Chelmsford, Massachusetts, but I've been told it's a short drive from Boston. I imagine my time will be about one hour. I am of the impression that one of the most valuable ways to give a talk is if I do very little talking and let the attendees ask questions. That way, they get the most out of their time. 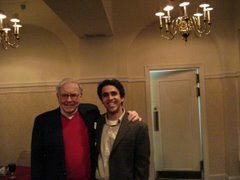 My plan is to spend about 15-20 minutes discussing six attributes/characteristics/qualities that seem to be common threads amongst the most successful money managers - Buffett, Miller, Pabrai. I will follow with a brief case study of a past investment that provides a good example to the business-like approach to investing. Then I will answer questions for the remainder of time. Feel free to stop by if you are in the area at the time!